As part of the Special Series: Food and Technology, today's post will continue the discussion on the role of technology in visual representations of food. In my last post, I had discussed how the internet has shifted the manner through which we conceptualize food and consumption. After the publication of that blog (Feminist Food Utopias in the Digital Age), I had the pleasure of reading Jenny L. Herman's article "#EatingfortheInsta: A Semiotic Analysis of Digital Representations of Food on Instagram," which analyzes digital consumption of food and adds further complexity to the conversation. Today, I want to focus on earlier visual representations of food, primarily during the 18th and 19th centuries. The desire to visually represent food is not a new phenomenon. While new technologies have shifted the means of communicating about food from paintings and illustrations to photographs to social media posts, humans have long preserved memories of dishes and plants. 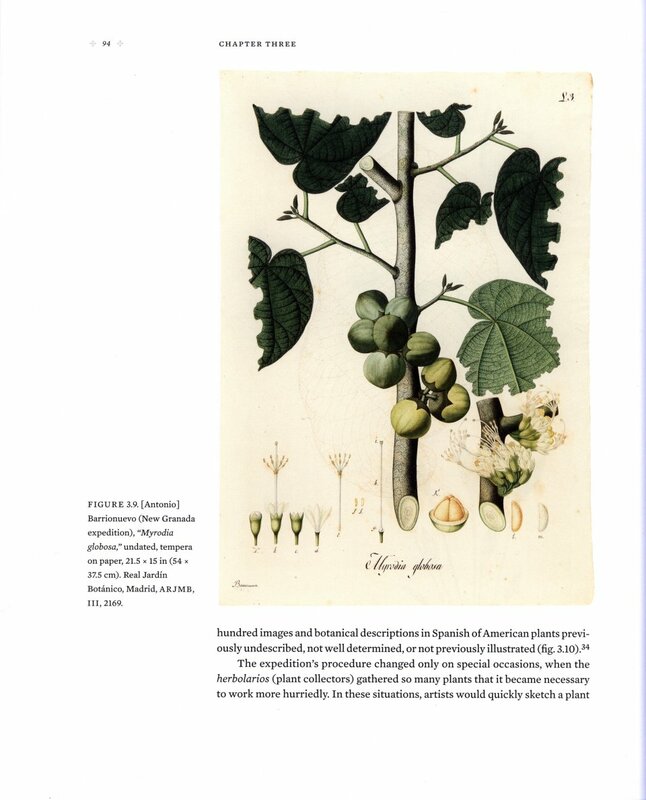 Art historian, Diana Bleichmar, argues in Visible Empire: Botanical Expeditions and Visual Culture in the Hispanic Enlightenment that scholars have for the most part neglected the visual materials of Spanish scientific expeditions during the Enlightenment and the history of visual evidence in both science and administration in the early modern Spanish Empire. Between the late 1770s and early 1800s 12,000 images were created on Spanish expeditions which depicted plants from all corners of the Spanish Empire outside of Europe including the Spanish Indies (which was comprised of much of South America, all of central America, the islands of Cuba, Puerto Rico, and half of Hispaniola and the greater Antilles), a great part of North America, and the Philippines. Bleichmar chronicles the ways in which these botanical drawings were only possible due to the close collaboration of large teams that included collectors, naturalist, and various artists. As a result, each image embodies not only a plant but also multiple observations, decisions, and negotiations between different kinds types of expertise. These images thus represent the "process of investigating, ordering, explaining, and possessing or attempting to possess nature" (2). According to the author, the Spanish were interested in natural history during this period, especially botany, as they searched their empire for a means to acquire new political and economic power; in a sense these drawings were a "botanical reconquista." Now this book is not unique in in looking at the way that plants motivated exploration and were integral to colonization. Judith Ann Carney's In the Shadows of Slavery, Africa's Botanical Legacy describes the role of plants in the triangle trade. Michael Pollan's Botany of Desire describes the role of apples in colonizing North America. However, what is unique about Bleichman's book and why it is especially useful in thinking about the role of technology in commodifying food for physical and visual consumption. Bleichman emphasizes the role of art and botanical illustration in conversations of imperialism and imperial science: "on the one hand naturalists and their patrons had high expectations for the economic and scientific benefits that natural history could bring ... a renewed and more powerful empire, one that could hold its own on a fiercely competitive international stage. On the other hand the naturalist and patrons both understood the project as fundamentally one of seeking to reimagine [their territories] as bountiful paradises of botanical productivity and profit rather than as territories littered with depleted mines" (40). The pictures satisfied curiosity for European viewers about various plant species, but, more importantly, these visual representations of food, these botanical illustrations, were able to bolster faith in the economic promise of the Spanish empire. One reason why the botanical illustrations from Spanish explorations are especially interesting and unique is because the art was made directly at the locations where the plants grew and not in Europe. The great majority of early modern representations of plants from "the new world" were done by European artists with no personal experience of the territories populations and natural products they portrayed (80). To repeat, most of the botanical illustrations from that period were done by Europeans who had never been to the territories and were either drawing plants that had been brought back to the continent or sometimes even illustrating plants based off of written descriptions. * The Spanish botanical artists were physically present in the habitats of their subjects but also trained in the conventions of European art and botany and thus were able to visually communicate with European viewers. If we are to believe Bleichmar's argument that the illustrations of edible plants represented the Spanish culture of colonialism and the Spanish Empire's economic motivations, what do our present depictions of food represent? If the Instagram picture of your apple pie means more than a photo of a sweet treat, what does it say about our culture? What are we actually consuming when we look at the production of digital food content? * Funny anecdote, while researching information for this article, I accessed a text which was a botanical guide that contained zero illustrations. The editorial note made me laugh out loud and caused other library patrons to stare. The note explained that the author thought that his descriptions "illustrated his point" about the plants. ** Anecdote # 2: I started thinking about this topic when I was planning a new tattoo. I went to the McGill archives and Rare Books to look at their collection of botanical illustrations and I began to think seriously about botany, history, food, and visual representation.